a. could be field trip, guest speaker or physical game, presentations, etc. How do I have Eric Jensen come directly to my school or organization to work with my staff? Contact Diane Jensen at (808) 552-0110 or email her diane@jlcbrain.com. She’s usually in Monday through Friday, 9-5pm, Pacific Standard Time. Eric Jensen’s brain-based learning approach focuses on practical strategies linking brain research to student achievement. 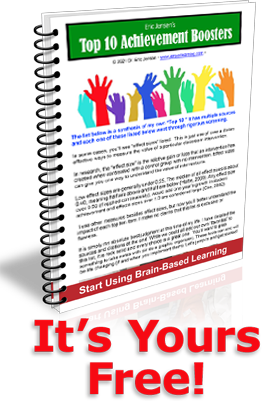 Brain-based learning is all about smarter, more purposeful teaching that can reach a greater number of students. It’s not any one single thing you do. It’s more about the on-going, purposeful aggregate of environment, instruction and curriculum strategies that makes it all work. Join us for an amazing, highly engaging experience that gives you cutting edge insights with easy-to-implement classroom and training strategies. Eric Jensen is a Highly Engaging, World-Class Staff Developer Who Blends Cutting-Edge Research, with School-Tested Strategies Your Teaching Staff Can Use Immediately! Click here for details. If you could make only one change this year.